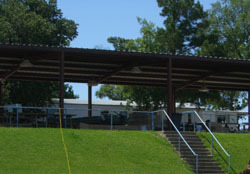 The Palms Marina Ship Store carries convenience items, food and beverages, boating and fishing accessories for any visitor from land or lake. 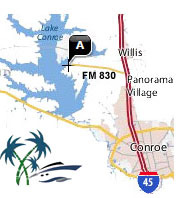 In addition, the Palms Marina has the best fuel dispensing dock on Lake Conroe. Loaded with 3 grades of fuel. Four pumps operate simultaneously to insure your quick return to boating over Lake Conroe. The Palms Marina is proud to be a proud to be a certified Valvtech marina. Be aware that ethanol blended gasoline and ultra low sulfur diesel can cause havoc to your boat’s engine without Valvtect fuel for marine engines. Don’t forget your Fuel Discount card for tenants of The Palms Marina. The team and people at the Palms are hands down are some of the most professional people I have met. The service and support is excellent. The site is pristine and clean and everyone goes out of their way to help. I cannot say enough about the value you get for your money at the Palms. I highly recommend them for your boat storage needs. Great atmosphere, great owners, very helpful employees, great fishing, wonderful bathrooms and clean, there just a better place to put your vessel. Security is awesome. Very friendly tenants... Very professional and courteous staff. Always throwing events to get the tenants together and mingle with each other... There just isn't anything negative to say about The Palms Marina. Very unique!! They are BOAT PEOPLE!! !